Shri Restaurant and Lounge opened in 2010, boasting a spectacular panoramic view of the city and a diverse menu offering tasty food and drinks. Shri is well-known for their selection of grilled food as well as unique cocktails crafted by their professional bartenders. Executive chef Javier Gomez brings in a Spanish twist to the menu, serving exciting dishes such as his signature classic ceviche, duck magret, and cinnamon bread pudding. 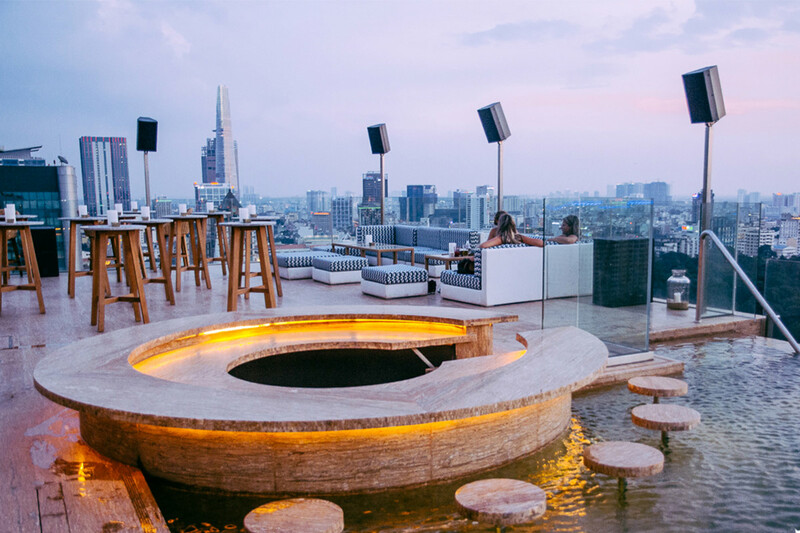 Shri is a hotspot amongst Saigonese locals, so to accommodate regular crowds, they even have a lounge where guests can relax when the terrace is full. 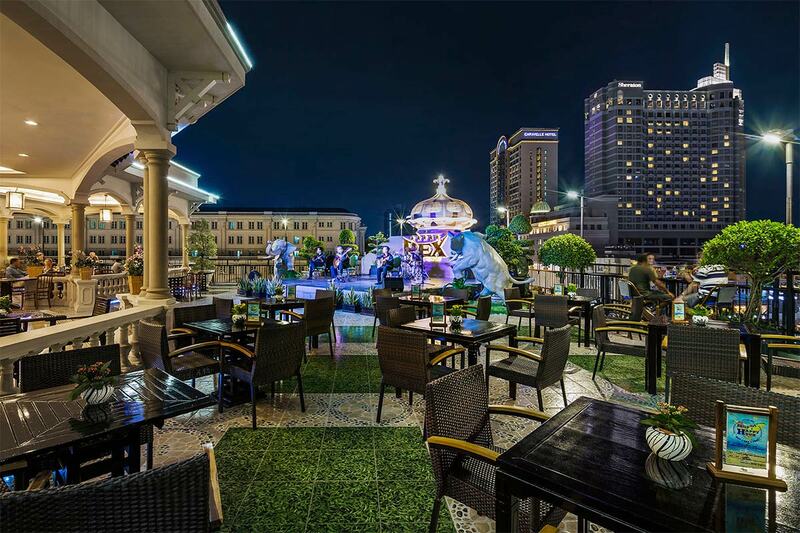 Lying on top of the luxurious five star hotel Hôtel des Arts Saigon MGallery, Social Club is a beautiful rooftop bar. If you’re looking for a romantic place for a date, drop by this place during their happy hour from 5-8pm. 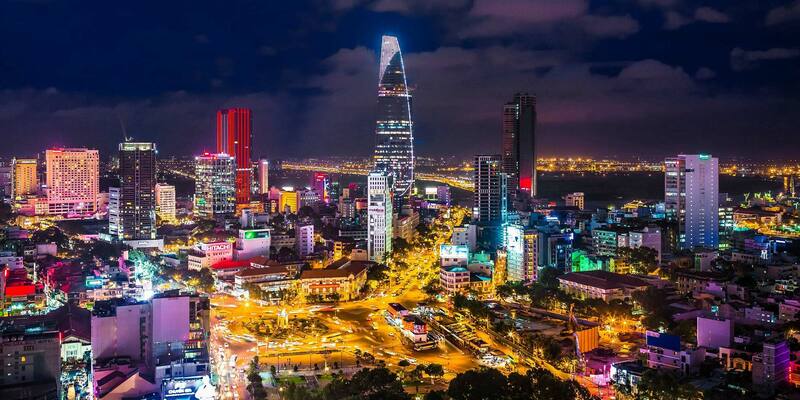 At night time, Social Club offers you a breathtaking view of the high rises in Saigon. In case you want to be indoors, Social Club has a lounge area right below its rooftop bar. Here, you can also enjoy the view of the city from the panoramic glass windows. 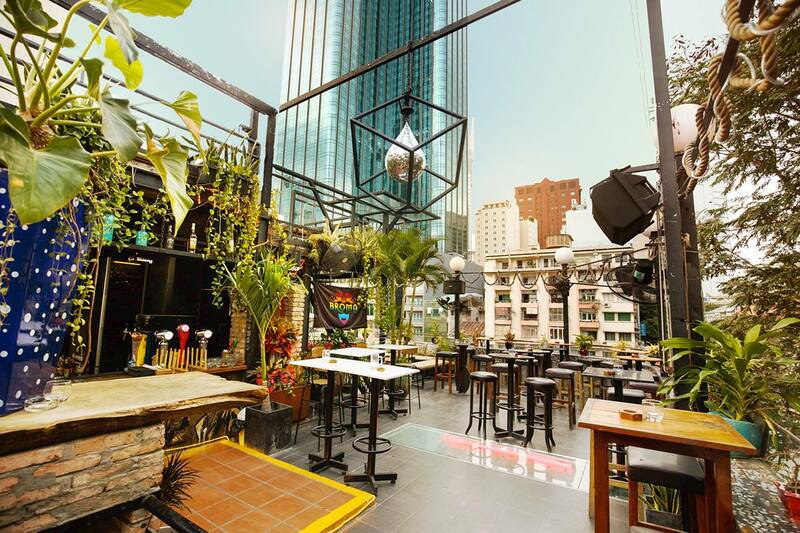 Rooftop Garden Bar has a long history, being a hotspot to get drinks for war soldiers, military personnel, and war correspondents during the Vietnam War. Even “Five O’clock Follies”, nightly briefings of the war, were held here. Serving delicious food and refreshing cocktails, the Rooftop Garden Bar is an ideal place to immerse yourself in the rich history of Vietnam. Even though the terrace is overlooking a constantly modernizing city, the atmosphere of this rooftop always remains the same and may even bring a sense of nostalgia and longing for the past. The Rooftop Garden Bar is open 24 hours a day so customers can come and dine any time they see fit and even enjoy live music playing in the background. Breeze Sky Bar is an old restaurant here in Saigon, but still a widely loved and appreciated spot in the city. 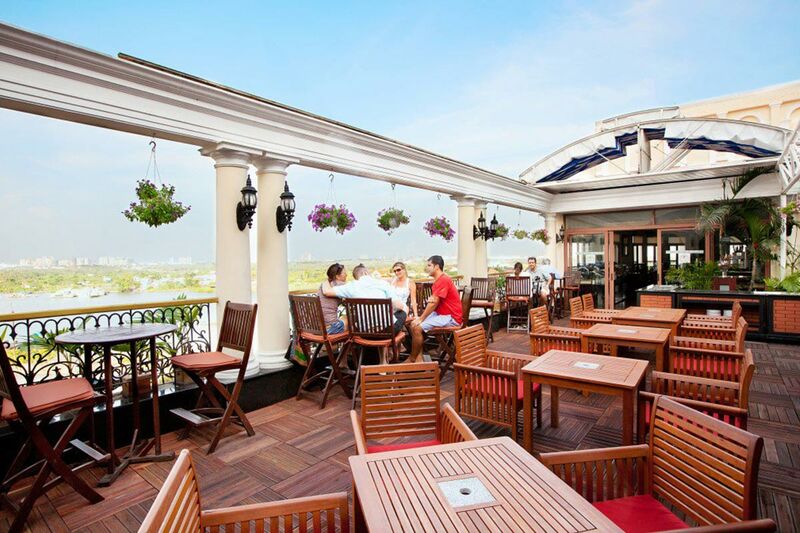 Located in the Majestic Hotel, an establishment that has been opened since 1925, Breeze Sky Bar is the embodiment of colonial charm with Art Deco designs, wooden furniture, and French-inspired interiors, making it notably unique from other places. Breeze Sky Bar is open all day and is a good spot to enjoy your food in a quiet and peaceful setting. M Bar is also in the Majestic Hotel, but is more notable for signature cocktails, snacks, and daily live music. Contrasting Breeze Sky Bar, M Bar is a better place to go if you’re looking for a “late night scene”. 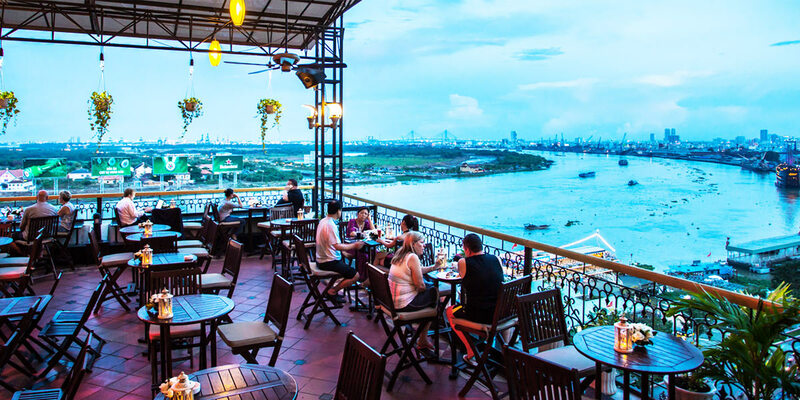 Despite not being on the highest of floors, it’s still the perfect place to watch the sunset in the evening whilst enjoying the breeze and overlooking the beautiful Saigon River. 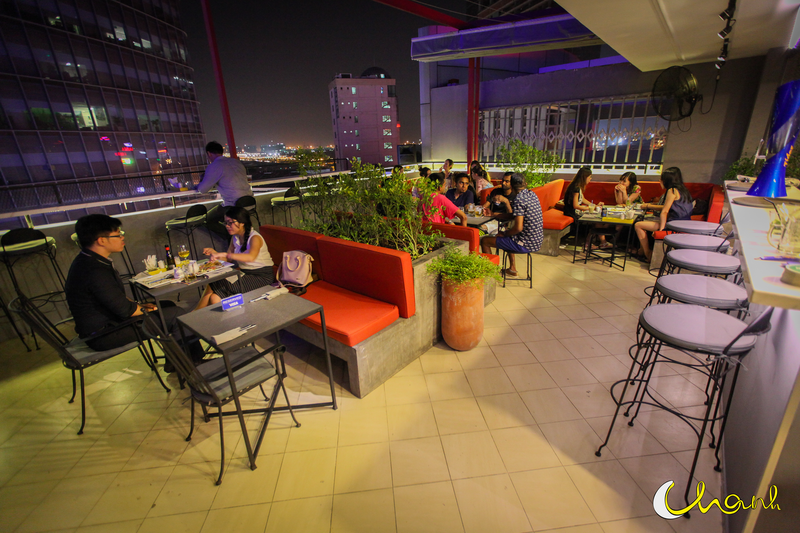 Chanh Bistro is a rooftop restaurant, serving Western food and drinks. 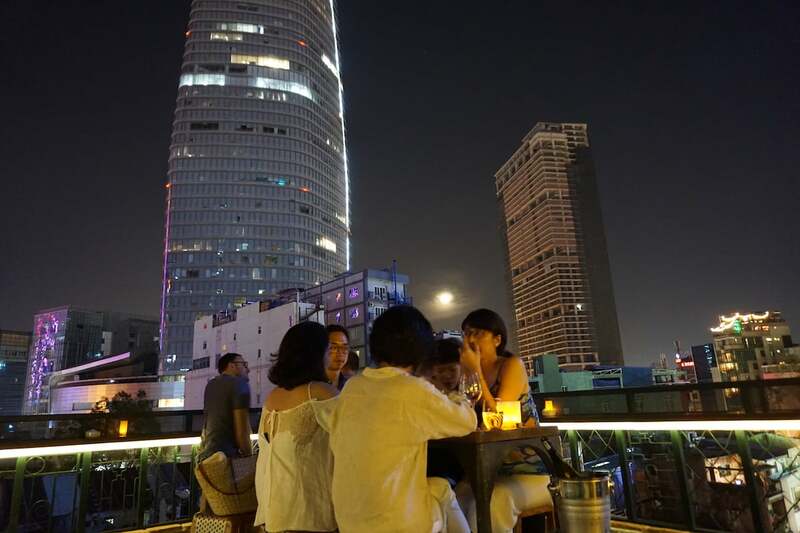 There are two terraces overlooking urban views of the city, and customers can get a good glimpse of the tallest building in Saigon (Bitexco Financial Tower) as it’s directly across. Chanh Bistro also offers vegetarian options to cater to all customers, serving dishes like Mediterranean ratatouille and veggie burgers. They’re also known for having “Fresh Oysters Fiesta” every week from Thursdays to Sundays, as well as “Happy Hours” every day. Anan is a rooftop restaurant that combines the old with the new. 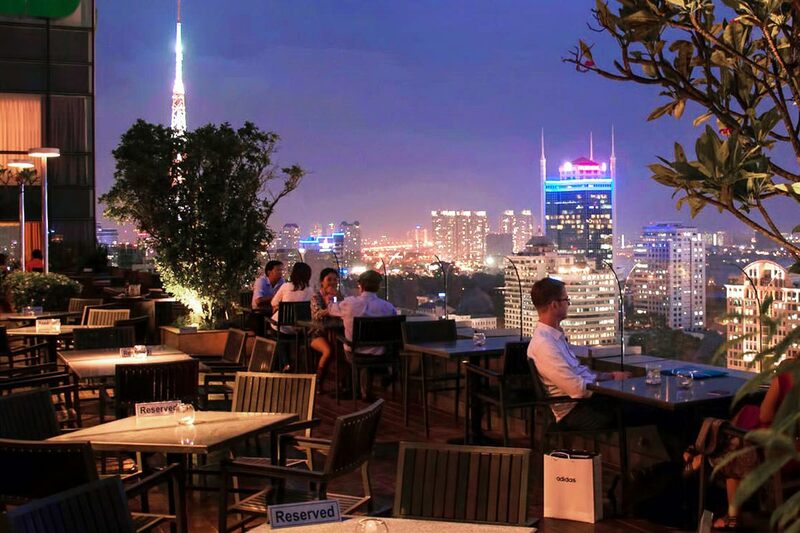 Set in the heart of Saigon, Anan’s rooftop overlooks both one of the oldest markets as well as Bitexco Tower, the tallest building in the city. Their menu combines the traditional flavors of Vietnamese food with the fusion of international cuisines. Anan also caters for vegetarian and vegan customers. On top of that, they offer a selection of crafty cocktails amongst other drinks. Anan is the place to go if you’re looking to relax in a contemporary setting with a lively atmosphere, whilst appreciating the beauty of old Saigon at the same time.